Helps to reassess the goals of language learners and teachers, and provides recommendations for teaching practice and for further research. 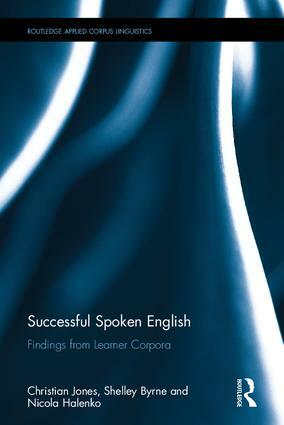 Successful Spoken English is key reading for postgraduate students of TESOL and Applied Linguistics, as well as for pre- and in-service English language teachers. What is a successful speaker of English? Christian Jones is Senior Lecturer in Applied Linguistics and TESOL at the University of Liverpool, UK. Shelley Byrne is Lecturer in English for Academic Purposes at the University of Central Lancashire, UK. Nicola Halenko is Senior Lecturer in English Language Teaching at the University of Central Lancashire, UK. The Routledge Applied Corpus Linguistics Series is a series of monograph studies exhibiting cutting-edge research in the field of corpus linguistics. Corpus linguistics is one of the most dynamic and rapidly developing areas of the field of language studies and it is difficult to see a future for empirical language research where results are not replicable by reference to corpus data. The aim of the series is to showcase the latest research in the field of applied language studies where corpus findings are at the forefront of the research.